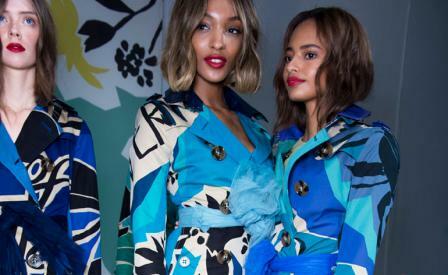 Christopher Bailey titled his upbeat spring collection 'The Birds and The Bees', but it will most likely be remembered as the season that Burberry did 'denim and sneaks'. The former started out as tailored jean jackets, cinched at the waist and teamed with a skirt of oversized yellow sequins (surely the bees), but as the show gathered pace, the denim archetype found itself cropped at the bust, and later collared with colour-blocked patent leather. Given the show's patchwork trainers and Bailey's latest affection for pleated tulle - either as diaphanous tiered gowns or tied around models' waists as sash belts - there was something rather Happy Days retro to the mood. Bailey's Burberry girl was clearly on the move, but there was also a romanticism to her degrade, tulle petal dresses, and the way he'd scribed 'Britain' on his closing trench series and insect-illustrated tent roof, linking to his S/S 2015 menswear show's English literature lesson, along with the British summer garden that often inspires the Yorkshire-born, Londoner's presentations.